Happy Monday! I am currently in New York and loving every second of it. Although, the weather could be a tad bit nicer. But that’s not going to stop us from enjoying the city! Anyways, more about my trip in a later post. Our friend Jayesh was in town last Sunday for work, so we invited him over for dinner. I knew I wanted to make chicken for the guys (I followed this recipe) but wasn’t sure about the sides. I went with asparagus because that’s one of Vishnu’s favorite vegetables (and ended up being Jayesh’s as well!). For my second side, I looked to Cook Smarts for some ideas. I came across a baked artichoke and spinach pesto risotto recipe that sounded delicious. However, I didn’t think any of my pans were oven safe so I made a stove top version. While it took a long time to make, I think it came out really well. Vishnu said the leftovers tasted even better! I know this doesn’t look all that appetizing, but trust me when I say it was DELICIOUS! First of all, the TJs masala burgers are probably one of my favorite things ever. All I did was take them out of the freezer, cook them in the microwave (one at a time) for 45 seconds, and then grill them in a frying pan over medium heat (no additional oil) for a few minutes on each side until brown. Done! For the curry, I chopped up one medium onion and sautéed it in a large pan (in a little bit of oil). I also added some garlic and jalapeno to the pan after a few minutes. Once the onions were translucent, I added a can of diced tomatoes. After letting that simmer for a few minutes, I blended the mixture until smooth. After pouring it back into the original pan, I added a few spices – garam masala, turmeric, red chili pepper, and salt. And finally, I added a can of chickpeas. That’s it. Will be making this again…and again…and again! I am one of those people that thinks the tomato sauce makes the pizza. And the more the better. Well, after this pizza, I may have changed my mind. 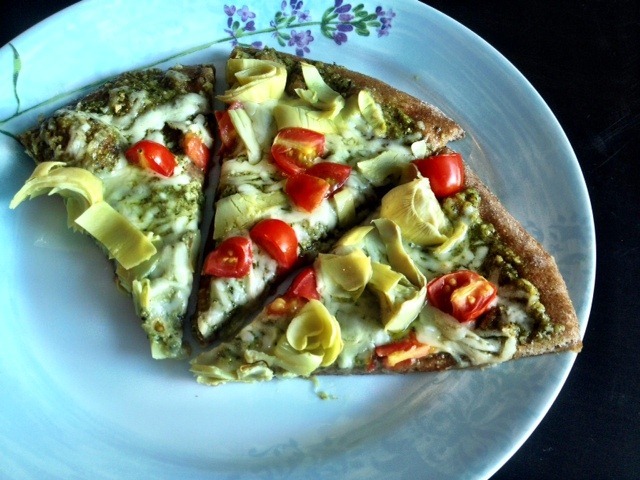 The flavors of the pesto with the artichoke, cherry tomatoes, and cheese were SO good and very garlicky! To make the pesto I just combined the following ingredients in my food processor – 1 packed cup of basil leaves, 1/2 cup walnuts, 1/2 cup parmesan cheese, 4 cloves of garlic, 2 tablespoons lemon juice, 1/2 cup olive oil, and salt and pepper to taste. It was perfect! The crust was made with premade whole wheat dough from Trader Joe’s. One bag of dough is supposed to make one 12 inch pizza, but because we like our crust a little thinner, I cut the dough in half and made 2 crusts out of it. I think it worked out well. And one more tip when working with this particular dough – cook your pizza for an additional 5-8 minutes (on top of the 12 that is recommended). We tried it after 12 and felt that the crust was a little raw so back in the oven it went. Vishnu and I are huge fans of veggie bowls – quinoa, roasted veggies, a protein, and a unique sauce of some sort. 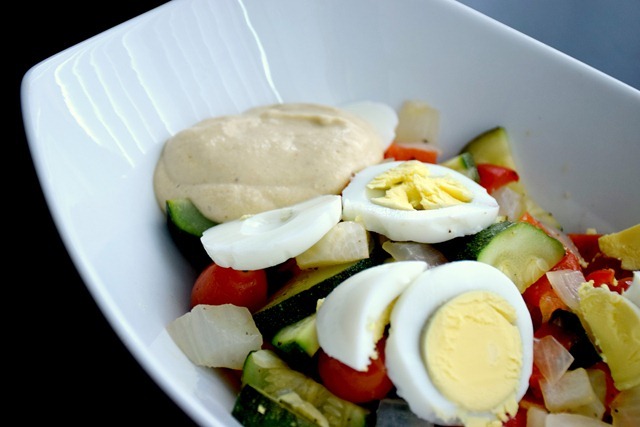 This week’s bowls were made up of quinoa, black beans, roasted veggies (zucchini, onion, cherry tomatoes, sweet potatoes), boiled eggs, and cashew cheese sauce. This vegan sauce was the absolute highlight of this meal. It was super creamy, a little nutty, and very garlicky (I may have used four cloves instead of just one). So there you have it…some of our more notable eats from the week! Next week’s post will be all about my New York City meals. Can’t wait to share! What was the best meal you made/ate this last week? 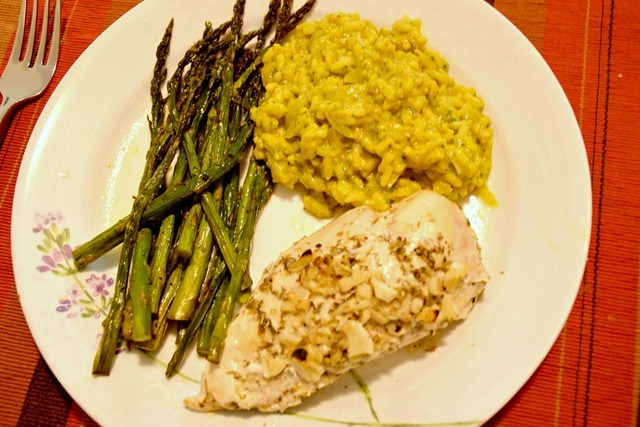 Oh wow deliciousness around- those boys are lucky…love the look of that chicken/risotto plate! One of the most delicious things I made this week was actually today’s lunch: Pumpkin & Rosemary Soup with White Beans! I’ll need to measure out the ingredients next time because it’s one worth sharing :)! Stop giving me NYC jealousy…please have a blast and a half on my behalf. Lucky I read posts and not just look at pictures otherwise I’d think you’d have stopped being vego and I would be so proud 😉 Just kidding. I need a food processor! Best meal I ate- curried tuna patties. A good change from beef patties, chicken patties and salmon. I’ve never tried TJs masala burgers but I’ll try to remember to get a pack next time I’m there! They sound delicious! Happy Monday, Parita!! I saw TJ’s Masala burgers and hesitated getting them – next time I will be picking a package up for sure! Your risotto looks fantasmagorical! 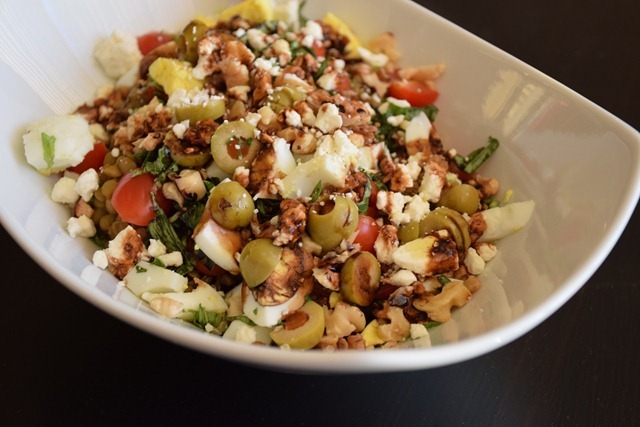 Your veggie bowl and lentil salad bowl are giving me a case of saliva-overproduction – they are completely droolworthy! 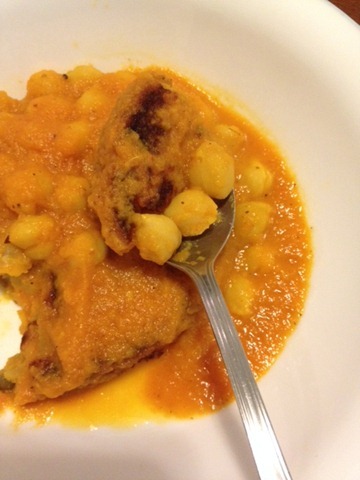 Love your notable meals posts, Parita – keep ’em coming! Hope you have a wonderful time in NYC! have so much fun in NYC!!!!! Just fly a little farther north and come cook for me!